This week we are chewing on matters of preaching and true godly holiness. I won’t review where we have been already, but please do go back to the first posts if you missed them. 10. 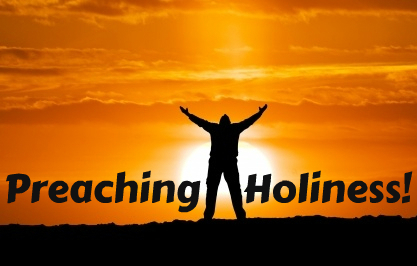 People need instructing in holiness, but never in a sermon severed from the glorious good news of the Gospel. There are plenty of instructional sections in the New Testament epistles, for example. Don’t go joyriding in an Imperative Harvester, but instead keep the instructions firmly planted in the rich soil of Gospel content within the context of their own Bible book. We might take weeks to preach an epistle, but the original hearers heard them in one sitting. So make sure you aren’t plucking instruction and losing the rich theological setting for them. 12. Holiness is not merely movement away from something, it is movement towards someone. False holiness will come across as a sour reaction against everything, whereas true holiness involves movement toward God, and out of ourselves toward others. Christlikeness involves being like Christ, who was no sour hermit. 13. We must think root and not just fruit in respect to holiness. If we ignore the appetites deep within, then we can give the impression that holiness is something people should pretend to like (while really only obeying through gritted teeth because they would much rather be sinning). The new inner relish given by the Spirit results in genuine hatred of sin and delight in God’s holiness. 14. The world should not be allowed to define holiness … neither contemporary culture, nor your parents’ culture. While some let contemporary cultural values shape their own, others let the cultural values of a previous generation do the shaping. Be Bible soaked so that it shows in your life, your personality, your attitude, etc. I think maybe you should have led with your point 12, or maybe even made that a whole post on its own. It’s so true, and so well stated.